An all too familiar scenario, the rear end starts to get a little unstuck, the driver doesn't catch it in time, and that's it, 3500+ lbs. of metal, plastic, and leather heading towards the scenery. Nissan has put a nice powerful road car in the hands of the general public, the likes of SGP, JWT, NISMO etc. have given the general public the ability to make an already quick car even quicker, unfortunately the skill required to back up that power and handling is not there, and even if the skill was there, often things just happen on the road people have no control over. "You're only as good of a driver as you thought you were until the rear end gets away from you"
What is the Racelogic Traction Control? A way of controlling excess power (or even just "normal" power in slippery conditions, IE ice, snow), without detracting from performance, or the driving experience (in fact I firmly believe that TCS adds to the driver experience). Conventional driving skill in a rear wheel drive car in over steer situations is to feather the throttle (lift-press-lift-press) as the rear end goes into over steer. Lifting off the throttle completely transfers the vehicles weight onto the front wheels unbalancing the car, or giving too much throttle decreases grip as the wheels spin even more, either method results in a trip to the scenery (at best, at worst potentially a lost life). 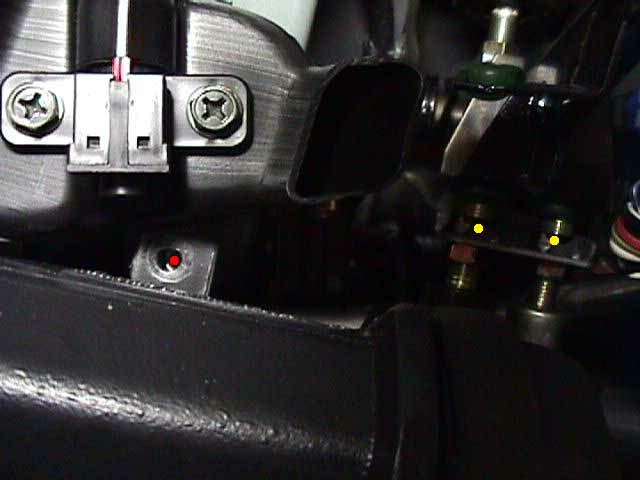 The TCS system feathers the throttle automatically, without closing the throttle (in a turbo car causing the engine to come off boost), or using the braking system. 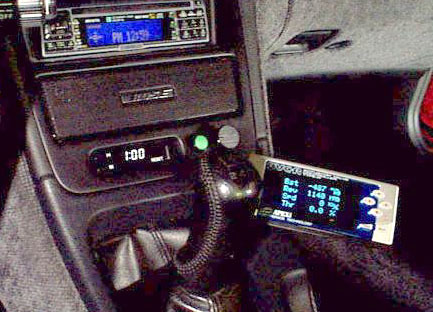 It interfaces with the ABS system to "read" the wheel speeds (and calculate the wheel slip on all 4 corners), and interfaces with the ECU harness to cut engine power by cutting fuel. The two additional modules I purchased were the launch control and adjustable slip controls. I would whole heartedly recommend the adjustable slip module, which gives you the "adjustable fun dial" as I call it. Basically you can select the desired amount of wheel spin on the dial 0%-5%-10%-15%-20%-OFF.. at 0% the rear end will not go into oversteer, 10% and you've got a bit of oversteer going on, 20% is for serious showboating!. Launch control allows you to do perfect launches whenever you want - it lets you build boost on the line, drop the clutch, maintain wheel spin and generate max acceleration off the line (perfect for those 60ft times!) . Whilst stationary you select the wet or dry launch (dry has a hard cut limit vs the wet soft cut limit, IE the dry will build more boost), press the launch control button, floor the throttle - the engine "bounces" off a secondary rev limiter controlled by the Racelogic system - in fact it sounds like a Rally Car on the start line. Once max boost is generated (around 5-7psi in Stg 3 car @ 5500rpm limiter), you let go of the clutch. The system modulates engine power to control wheel spin - gradually feeding in engine power until full power is unleashed and then it's time for 2nd gear! The launch is absolutely incredible, but a side effect is you have to have a good clutch, otherwise this will ruin the clutch quickly. Speed shift allows you to leave the gas pedal on the floor while making shifts. When the clutch is pushed in, a new rev limit is imposed on the engine so the engine won't over-rev when the drivetrain is disengaged from it. Coupled with the launch control, it can make a standard perform like an automatic for acceleration. 1. If it cuts fuel, doesn't that mean it will detonate? An emphatic NO, what it does is cut enough fuel to create a complete misfire on one injector pulse, cycling around all the cylinders. Enough fuel is cut out so a complete combustion won't occur, but not too much fuel so that the cylinder won't dry out. 2. I've been in production cars with Traction Control, they were more of a detriment, how come this one is so different? 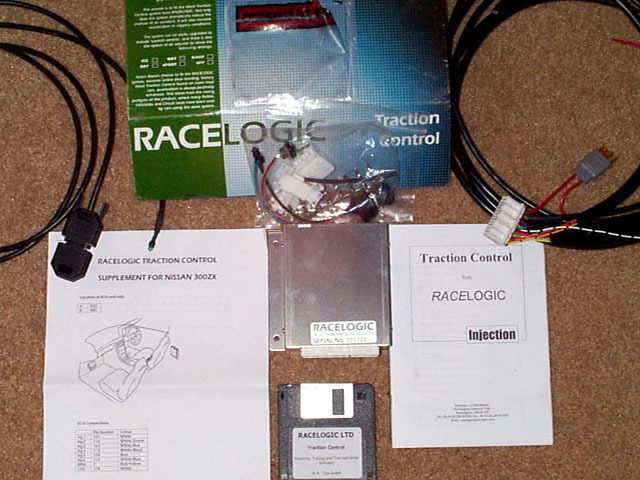 The Racelogic system is race derived, and adjusted to each application. It has an extremely quick sample rate, and is fully adjustable in how much fuel it cuts out, which revolutions the fuel is cut, which cylinders etc etc all settings are accessible via a PC connection. The system only cuts just enough power to limit or eliminate wheel spin, but not so much to degrade performance. Many production systems are too slow at reacting and cause the engine to drop power dramatically when they kick in. 3. But I'm a good driver, I don't need it! No human can modulate engine power without using the throttle, so even if you were Michael Schumacher, you still wouldn't be able to control power delivery without closing the throttle, and doing it 10 times / sec. 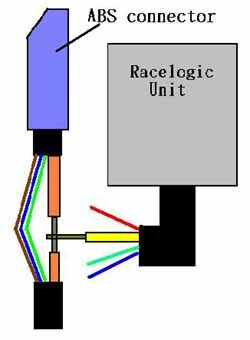 There is a reason why lots of racers choose to install race spec traction control systems, as it offers the ability to bury the throttle and get the maximum amount of power delivery without having to modulate the throttle as the rear end starts to get unstuck. 4. So, what's it like? Full throttle, 2nd gear, in a stage 3 car on super grippy 17" tires partway through a corner, in the wet, and not having the rear end go into oversteer sets the stage for how well this system works. I simply could not believe the night and day difference in character of my TTZ in both wet and dry conditions. In the wet it changes the car from being on the thin line, to completely in control, in the dry it allows me to get on the throttle earlier, and hold the throttle down in a corner. You get to a point where you jump on the throttle immediately after turn in, and only lift if you're understeering. It's an eerie sensation, especially if you're "used" to driving a rear wheel drive car, but after a while you get totally comfortable with the system. I asked Racelogic "Would I know when it starts cutting power?" "You will".. and you do, the engine sounds like it's missing, but not badly. Hard to describe, but it cuts in and creates a repeated misfire that sounds very "race-car-ish". Strongly recommended for anyone, be it Drag Racers, Road Racers or Sunday drivers. Take your time and make sure all your electrical connections have good continuity after each soldering joint by using your multimeter (set on resistance) with the probes on either side of the solder joint (i.e. one probe at the pin of the harness connector and the other about an inch past the solder joint). Wires which are multi-colored are denoted as follows: "main color/stripe", such that "white/green" means a white wire with a green stripe. The pin number of a specific wire is indicated in parentheses after the color wire. 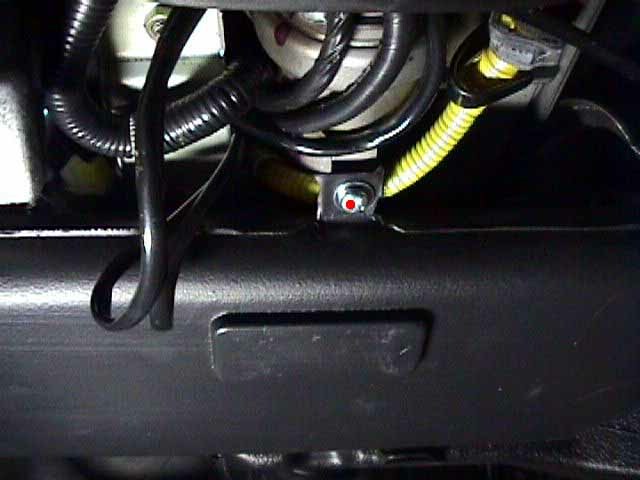 For example, white/green (8) means the white wire with a green stripe that is connected to pin number 8 of the harness connector. Be sure to cover all exposed wires with electrical tape or heat shrink after soldering/crimping. Abbreviations used: ECU = electronic control unit (the brains of the car), ABS = anti lock braking system. 1. Use a deep 10 mm socket or wrench to disconnect the negative (-) terminal of the battery (the black cable). 2. 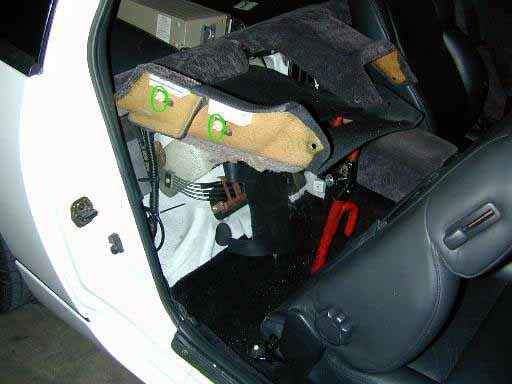 Access the ECU which is located under the passenger floorboard by removing the floor mat, pulling back the top part of the carpet, unscrewing the four 10 mm bolts that hold the wooden panel, and removing the wooden panel. 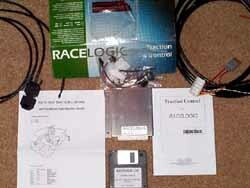 For more detailed instructions and pics, see the FAQ for instructions on running an ECU diagnostic. 3. 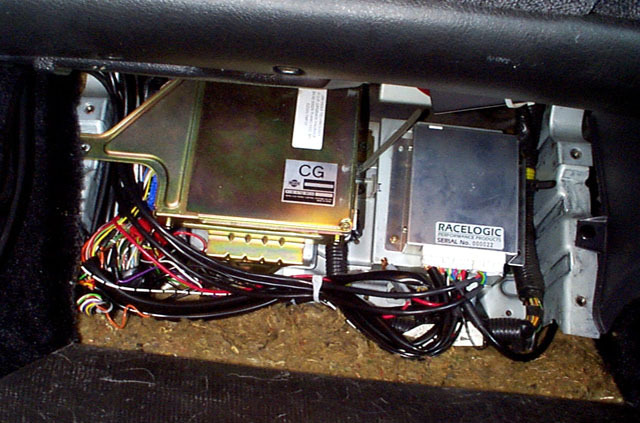 Disconnect the ECU by unscrewing the three 10 mm bolts that hold it in place. 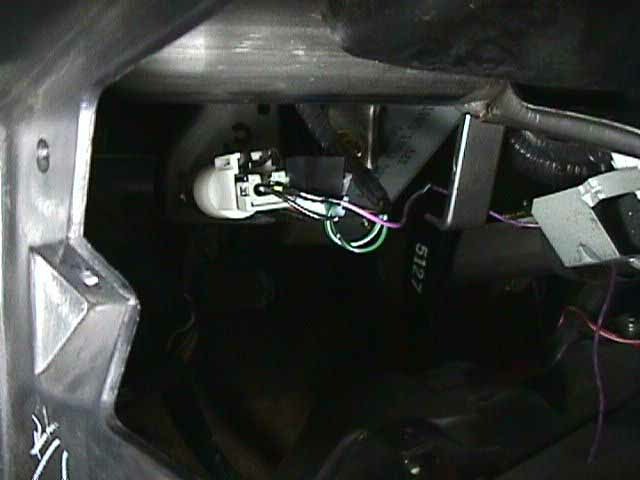 Then, remove the harness from the ECU by unscrewing the 10 mm bolt in the middle of the blue connector and pulling the connector out from the ECU. 4. Cut away some of the black insulation around the Racelogic unit harness wires and locate the 6 fuel injector wires (green dots in 2.) on the ECU harness. 5. Use the multimeter set on "resistance" to make sure it's the right wires. Put one probe into the ECU connector and the other on the cut wire. 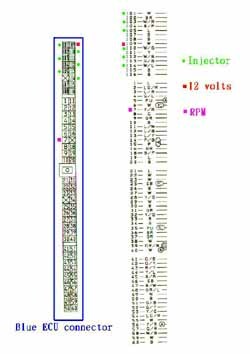 If you have zero ohms showing (means that there is continuity), then it is the correct wire. 6. Cut the fuel injector wires and connect the Racelogic wires to either end. The wires may be connected in one of three ways: solder them, crimp them, or use the included male/female pins and plastic connectors to make your own connectors. If opting for the third option, make sure to have the proper crimp tool ($5-10 from Radio Shack). Making a connector is convenient if the Racelogic unit has to be taken out (that way, just snap the injector wires back together), but it is more time consuming and easier to mess up if the right crimp tool isn't used. 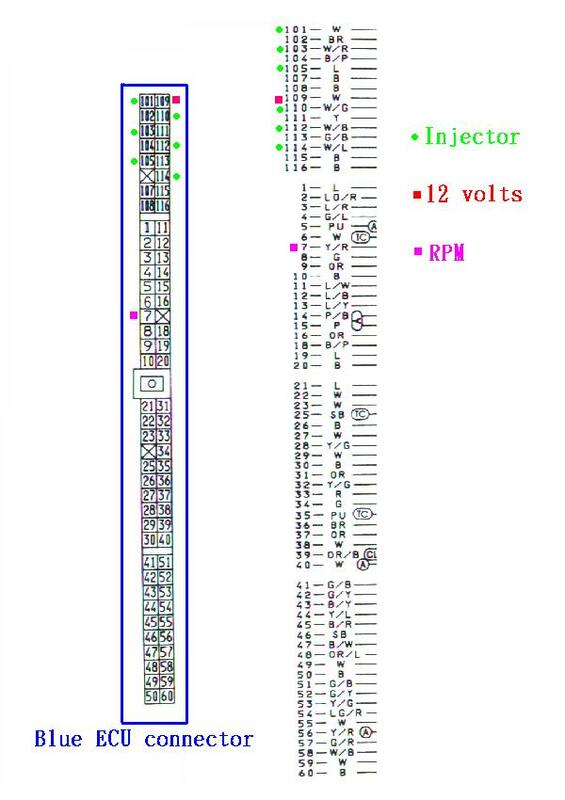 Make sure to put a female connector and a male connector on the injector wires and the correct ones on the Racelogic harness! Connect the following 12 wires together, These are the ones going from the ECU to the Racelogic unit. NOTE: Do NOT splice the Racelogic wires into the intact fuel injector wire. They must be CUT. 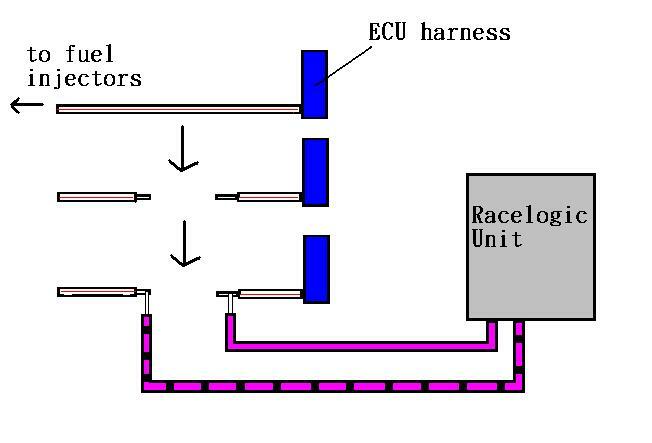 By connecting the Racelogic wires to either end, it allows the signal to go from the ECU to the Racelogic unit, and then from the Racelogic unit to the injectors (3.). Thus, the Racelogic unit essentially "intercepts" the ECU signals before they go to the injectors. 7. Splice the black/white Racelogic wire into the yellow/red tach pulse (pink dot in 2.) ECU harness wire by removing a little bit of insulation from the yellow/red wire to expose bare wire and solder the black/white wire to it. 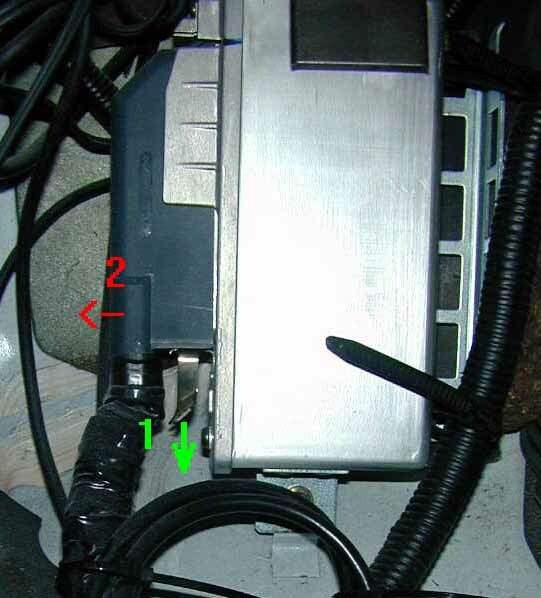 NOTE: This is splicing into the INTACT wire� NOT cutting it in two like the injector wires. 8. Splice the red Racelogic wire into the white (red dot in 2.) ECU wire (red square in wiring diagram above). Again, do NOT cut the white wire, just remove some insulation and connect the Racelogic wire to the bare wire. 9. Bolt the double black Racelogic harness wire with the ring terminal to a suitable ground. I found a few nuts above and to the right of the ECU that I simply undid, slipped the ring terminal over, and tightened the nut over it. Do NOT try to attach the ground to a painted area. 10. 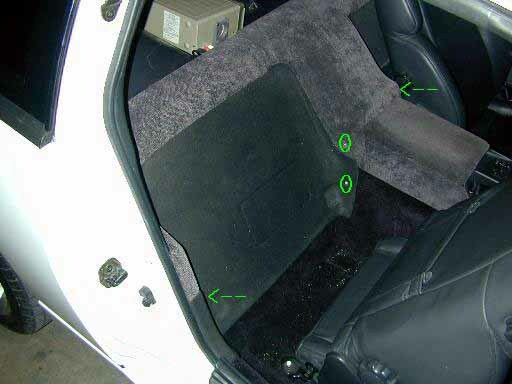 Locate the ABS unit, it's behind the passenger seat. 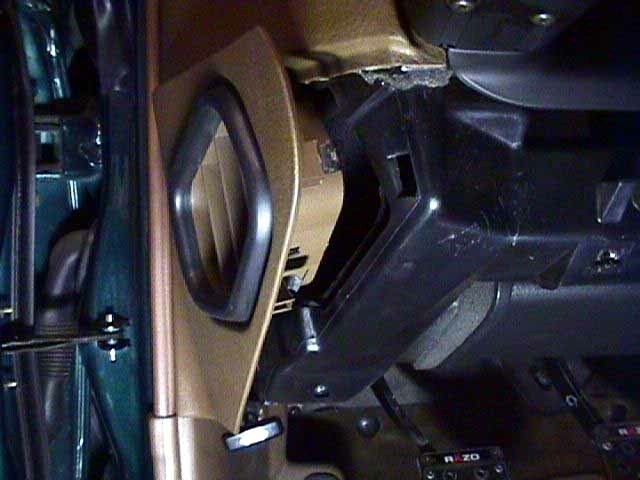 To access it, unscrew the two phillips screws that are on the center console (green circles in 4. 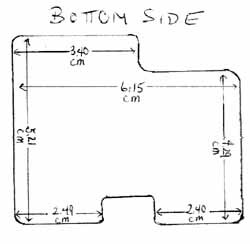 ), also unscrew the two with little black covers that can be flipped up with the flathead screwdriver (green arrows in 4.). Prop up the center section and remove the last screws underneath (green circles in 5.). Pop out the two plastic grommets (green circles in 6.) on the left side of the panel and prop the panel up. I used my CLUB anti-theft device to prop up mine. 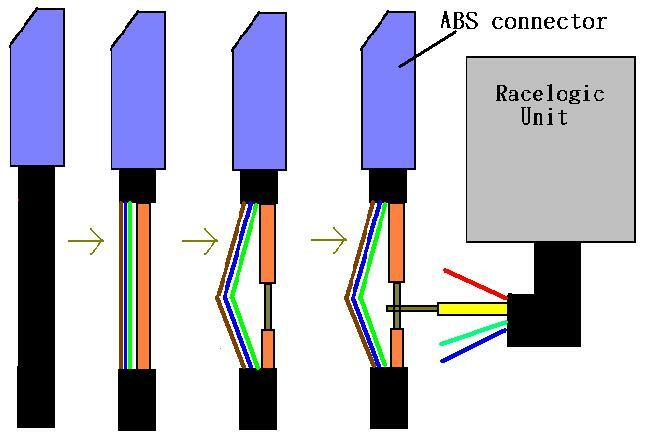 Splice in the Racelogic wires as per the diagram below, do NOT cut the ABS wires in two. NOTE: There are 2 identical brown wires in this harness, one goes to pin 1, the other goes to pin 8. Make certain the brown wire tapped into is the correct one. NOTE: the blue wire on the '95 connector is in slightly different location, see listing above. I think this change is due to the new style ABS actuator on '94+ models. 12. Route the ABS wires back to the ECU area. 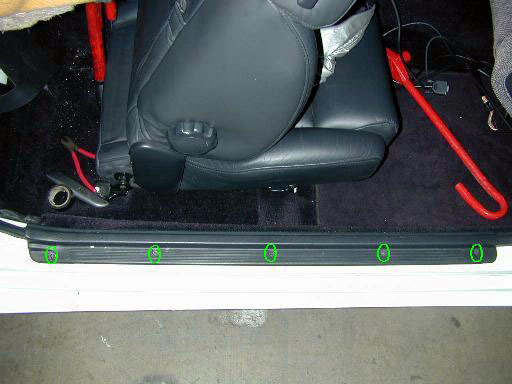 The easiest place to put the wires from the Racelogic unit is in the door sill. Simply unscrew the phillips screws (green circles in 10.) and stuff the wires beneath the black plastic panel. Be sure to keep the wires away from sources that may cause interference. 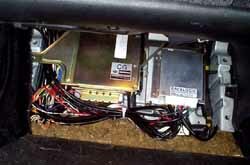 For example, if there's a 12,000 gigawatt stereo system involved, do not place the Racelogic wires on top of the speaker wires. The electrical impulses traveling through the speaker wires (not line level cabling, but speaker level wires) may induce false signals in the Racelogic wires. The Racelogic wires are shielded, so it's unlikely to happen, but it's better safe then sorry. 13. Mount the controls. This is a matter of personal taste, but Orion and I wanted to show you where we mounted our stuff. 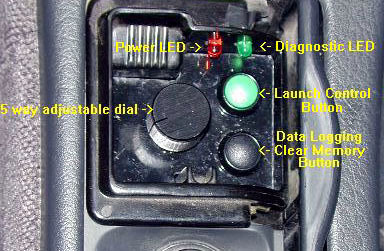 Orion mounted the launch control and adjustable dial next to the clock (11.). I put mine in the ashtray for a "stealth" look (12. ), so when the ashtray is closed, the controls aren't visible. need to connect my laptop, I just pop open the glove box and pull it out. 15. Connect and mount the Racelogic unit. 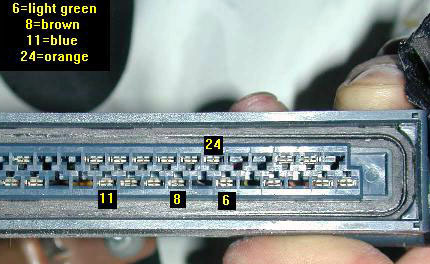 Plug all of the white connectors into the Racelogic unit. There's a nice space next to the ECU where the unit can be taped/velcroed in place (14.). 16. Calibrate and adjust settings. Calibration is explained very well by the instruction manual. I'll just add be sure to drive at a speed that will allow for NO wheel spin while calibrating, otherwise it'll confuse the unit. Make SURE the following are set correctly before taking it out on the road. Follow the instructions for connecting a PC to the control unit using the built in serial cable. Use Procomm (provided with the unit), turn the key to the ACC ON position... this will turn on the traction control unit and Procomm will show a prompt on the screen (something like "VTRAC6"). MAKE SURE YOUR CAP LOCK IS ON!!! NOTE: Do NOT measure the tire/wheel diameter with a ruler. This is VERY inaccurate and will throw off the traction control unit. 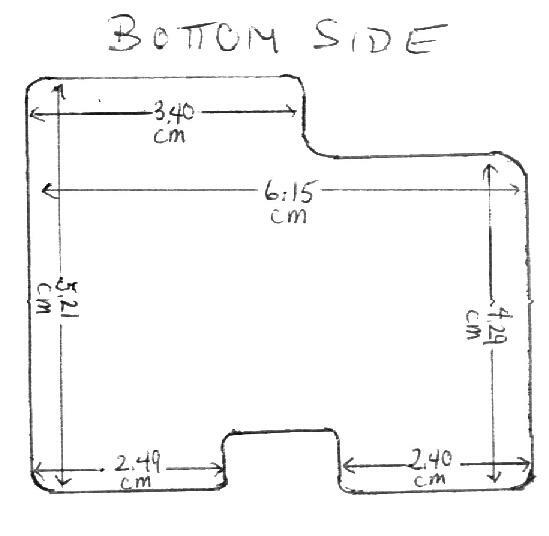 If there are problems do the calculation, please e-mail me with the tire sizes and I'll do them for you. This tells the unit that 1 and 3 are the rear wheels and 2 and 4 are the front wheels (because OFF = driven and ON = reference). This tells the unit that A and D are the right wheels and B and C are the left wheels. Hit esc to go back to the main menu. Under C. - configuration menu, make sure that "C", the number of cylinders is "00006". The amount of traction control you'll want will depend on the power output of your engine. The default settings are fine for about 400-450 crank hp. Once higher than that, a few settings will have to be tweaked. More traction control can be dialed in by changing the slip percentages to lower numbers. For maximum straight-line acceleration, 8-10% wheel spin is optimal. If that still isn't enough to control all of the spin, play around with the fuel cut tables to adjust. 17. Speed shift option installation. Remove the trim panel under the steering wheel (4 x 10 mm bolts) (red dots in 15.). It's got two tabs on it to hook it into the dash after the bolts are removed. Remove the side vent trim by pulling outwards (16.). 19. 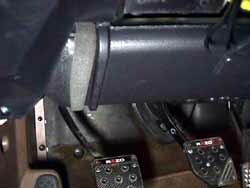 Remove the screw holding the lower vent tube to the steering column (1 x phillips) (18.). Look at how the outer vent tube connects to the lower vent tube (19. ), pull/twist/whatever to extract the outer vent tube and the lower vent tube from their current position (20.). Be careful, there's a sensor on top of the lower vent tube with wires coming off it. 20. Run the purple wire from the traction control wiring harness over to the driver side of the car. This will take a few attempts. I've used a coat hanger stretched out and a bit of electrical tape for the wire to angle my way across the center console under and behind the radio. 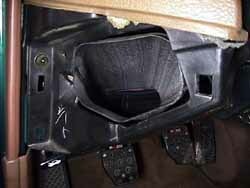 As a last ditch effort, pull the radio section out of the center console to get the wire guided across. Carefully thread the wire to the two upper clutch switches (21.). Make sure it won't interfere with replacing the vent tubes, or the motion of any of the pedals. 21. 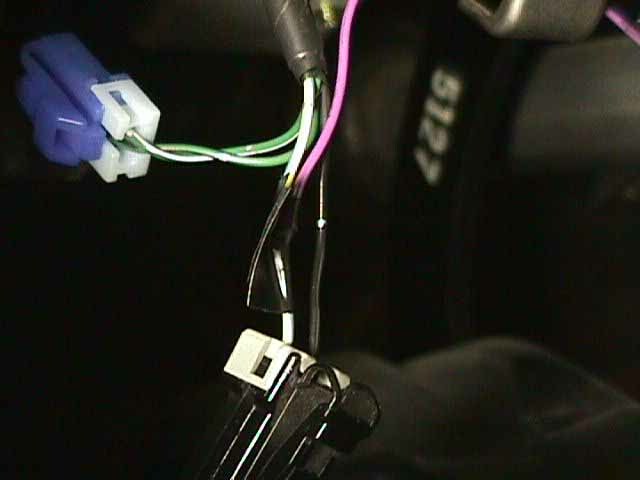 Splice the purple wire into the outer upper clutch switch's non black wire (I never could make heads or tails of the wiring diagrams in the service manual). Double-check the continuity of this connection before splicing into the wire. Is should go to ground when the pedal is pressed down. 22. 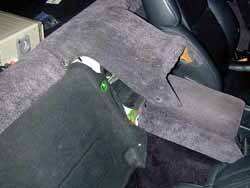 Reassemble the underside of the dash. 23. In the main setup menu, select R. for rev limits. There's two ways of configuring this. I choose having a lower rev limiter for the speed shift. I have mine set at a hard cut of 04500rpm and a soft cut of 04250rpm so it will make for near perfect gear speed matches when shifting from redline. The car can be driven almost like an automatic with it set like this. The only problem is the clutch switch is *extremely* sensitive. 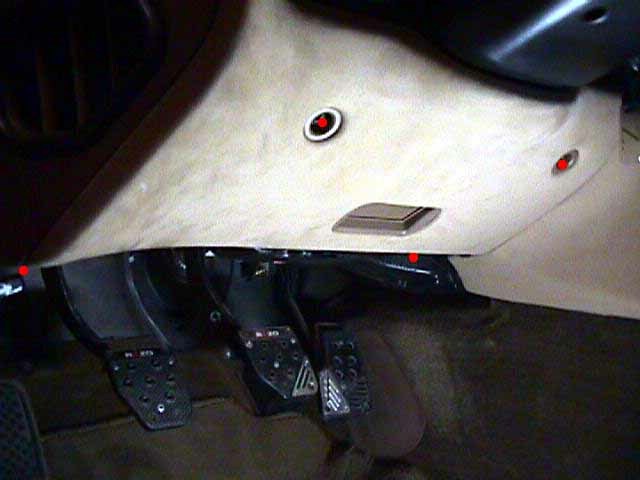 Covering the pedal with a foot during a series of upshifts will probably prematurely trigger the rev limiter, causing the car to convulse. Some practice is involved in making this work out neatly, but the results are very nice once it's gotten used to. The second way is to configure the hard cut rev limiter to be about 500rpm under the real redline. This makes for more drag racing worthy speed shifts, but is hard on the clutch, as the rpms will have to drop back to the 4500rpm range for the next gear up. The entire concept of the speed shift function is difficult to get used to. It's very unnatural to leave the gas pedal all the way down while shift gears. It definitely takes some time to get used to. All pics on one page for printing.